Several puppies on Sunday were spotted at Oakland International Airport, but they weren't there to play with travelers. They were there for business. 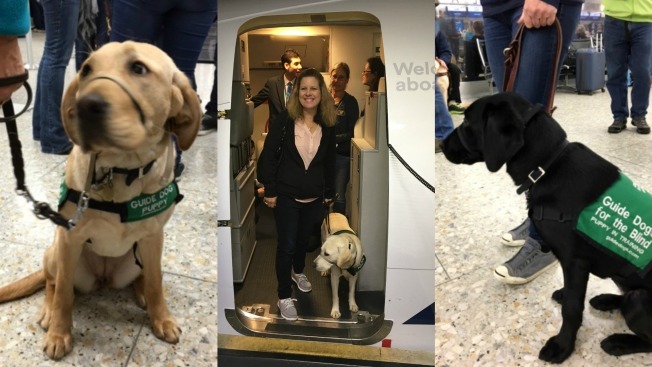 Some 25 pooches were trained how to help visually impaired travelers navigate throughout the airport and help them accomplish air travel tasks. The four-legged animals were instructed how to properly guide people through security checkpoints, check in at a gate, board an airplane, meander around an airplane and even help folks locate the baggage claim area. The training program features a partnership between Alaska Airlines and several Bay Area dog clubs.